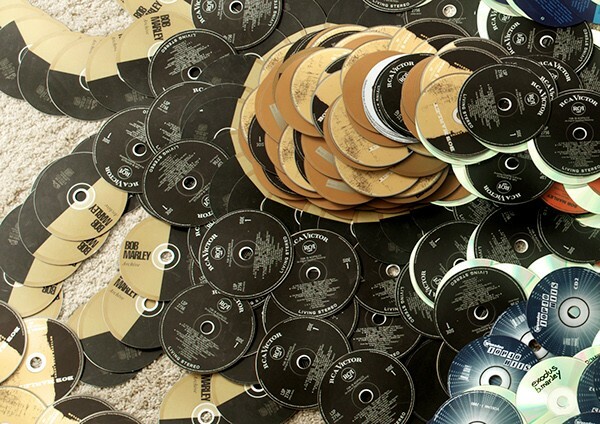 In an age of Netflix, Spotify and iTunes, we continue to leave behind a large trail of redundant CDs and DVDs. Turning those discs made from layers of aluminium and polycarbonate plastic into something useful, let alone beautiful is no easy feat. In the UK, only a handful of recycling centres will take them – and there are only so many CD clocks this world needs… But the following creatives have managed to elevate CD art to new heights, reusing these shiny little morsels in their thousands. Could spatial and architectural applications be the answer? 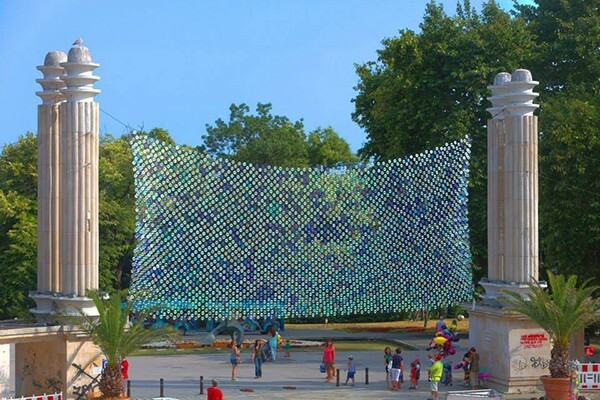 Mirror Culture was a community based project in Varna, Bulgaria by Bignatov Studio, inspired by the reflection of light on water. 128 volunteers helped to create a large sparkling tapestry, using 6000 CDs and a custom made fishing net. The installation was hung at the gates to the Seaside Garden. Photos courtesy of Borislav Ignatov. Bruce Munro is a lighting artist who has used redundant CDs in several of his installations. 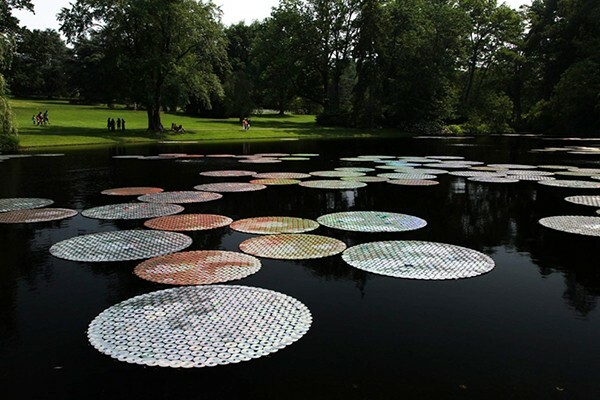 For Water Lilies he upcycled 65,000 CDs into giant water lilies at Longwood Park in Pennsylvania, famous for its homegrown Victoria lilies. The work was partly inspired by the book The Voyage of the Dawn Treader by C.S. Lewis, which depicts a sea of white lilies that signify the border between two worlds. It also draws inspiration from a Georgia O’Keeffe painting, Sky Above Clouds IV, that shows a clear blue Arizona sky populated by abstracted clouds receding from the bottom to the top edge of the canvas. 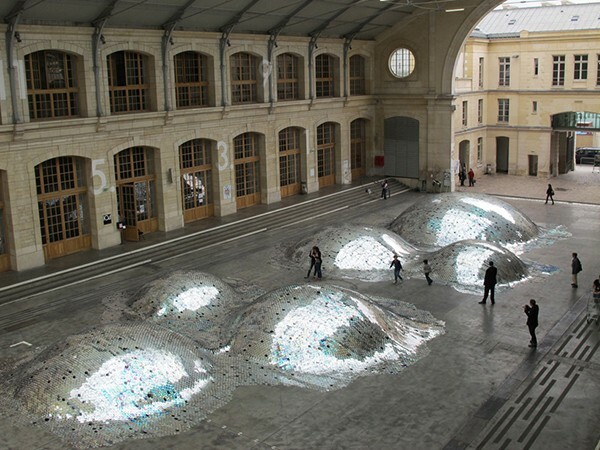 WasteLandscape was a 500 square metre installation by artist Elise Morin and architect Clémence Eliard at the Halle d’Aubervilliers, a former funeral home turned art space in Paris. 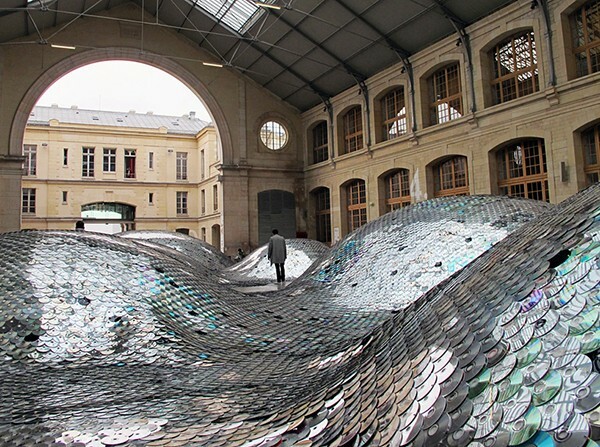 The artificial hilly landscape is blanketed with 65,000 CDs which were collected, sorted and then sewn together by hand to create an undulating and reflective surface. It is well known that CDs are condemned to gradually disappear from our daily life, and to later participate in the construction of immense open-air, floating or buried toxic waste reception centres. Made of petroleum, this reflecting slick of CDs forms a still sea of metallic dunes: the art work’s monumental scale reveals the precious aspect of a small daily object. 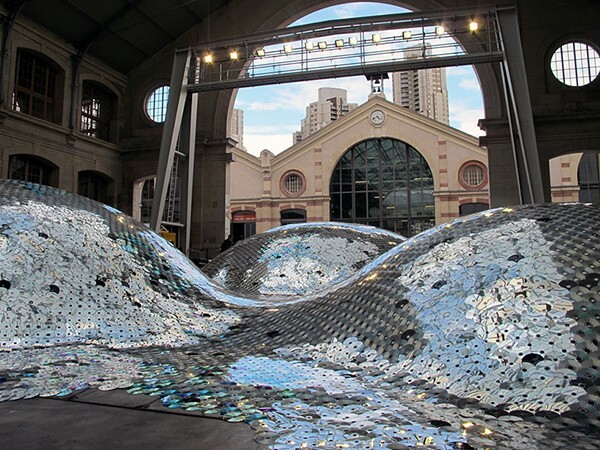 At the end of the installation’s tour, all of the CDs were recycled into polycarbonate. (Photos by Yannick Fradin, Martin Eliard, Marc Sirvin). 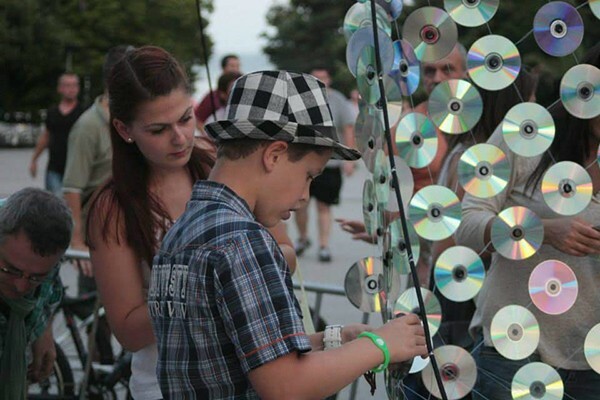 An exceptional example of CD reuse was demonstrated at the PIRACY exhibition in Milan. 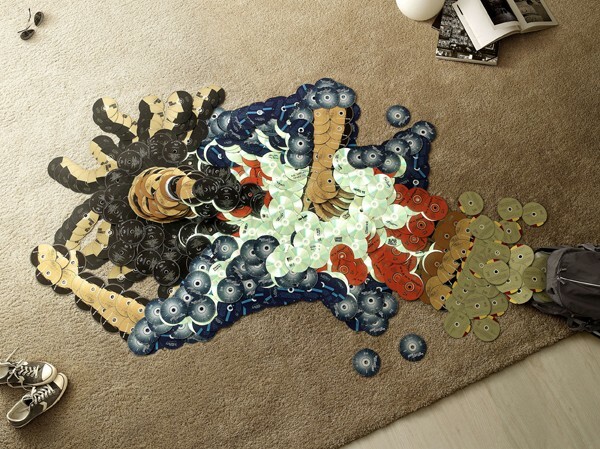 It featured the work of Italian artist Marco Pagano who literally throws CDs on to the floor and recreates images of music heroes such as Freddy Mercury, James Brown and Bob Marley. Check out the awesome video of Michael Jackson in action here. 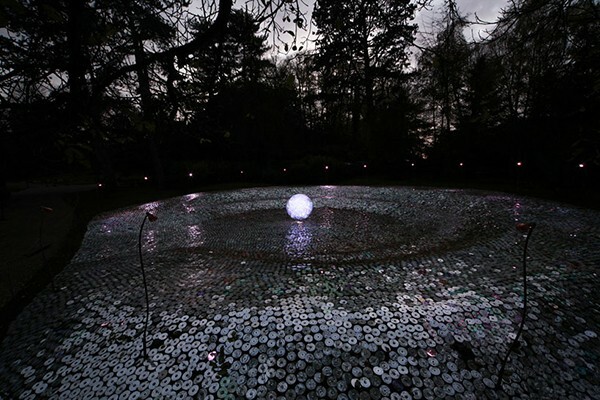 In 2012, Bruce Munro installed a carpet of CDs at Waddesdon Gardens in Buckinghamshire, England. Positioned in the centre is a 1.5m moon made of coiled optic fibres. 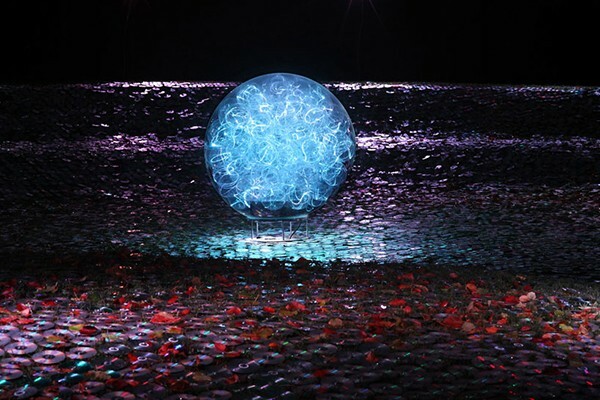 The blue orb is kept alight by a metal halide projector and illuminates the CDs by night. Photos by Mark Pickthall. 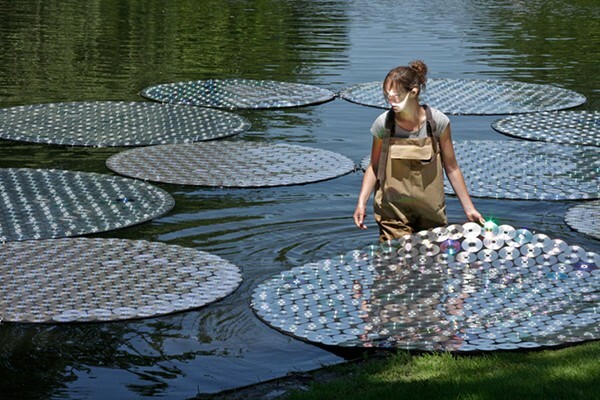 See also CD Sea and Angel of Light by Bruce Munro.